Scarborough is a unique flavor blend, focusing on botanicals traditionally found in more culinary applications but are now working their way into the cocktail world. We love savory drinks – it doesn’t matter if we’re sipping on an aquavit gimlet, a tequila old fashioned, a sherry cobbler, or just a vermouth on the rocks, it’s the perfect foil to sweet or citrusy drinks during the summer. 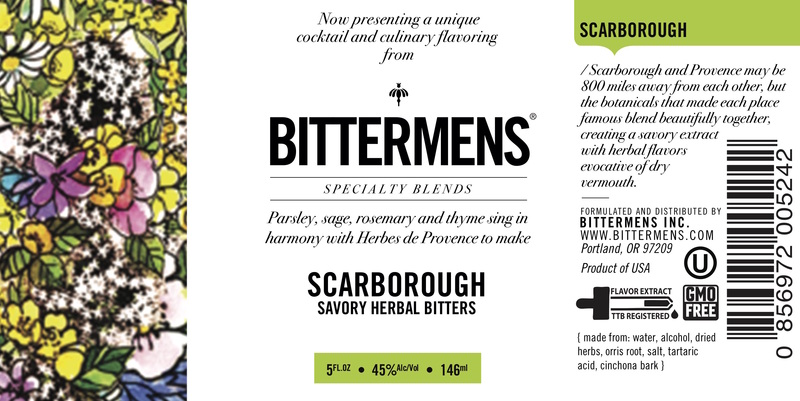 The Scarborough Bitters were born out of our love of savory drinks, especially drinks with vermouth. What we figured out years ago is that when you take all of the bells and whistles out of dry vermouth, the core flavors are pretty darned close to Herbes de Provence. Thanks to Simon and Garfunkel, we also know that if you’re heading to Scarborough Fair, there’s going to be some parsley, sage, rosemary and thyme involved. Well, rosemary and thyme are already in most Herbes de Provence blends – and the woodsy sage notes and bright-yet-bitter parsley meshes with them perfectly. To this, we add a little cinchona bark for classic bitterness as well as tartaric acid, the acid found in wine. How do you use these bitters? Lots of ways! Verde Mary: green tomato and tomatillo juice, tequila (or vodka) and the Scarborough bitters. Rosé Spritz: Dry Rose, soda water, 10 drops of Scarborough Bitters, on the rocks in a large wine glass, rosemary garnish. Improved Bamboo: 1.5 oz Amontillado Sherry, 1.5 oz Dry Vermouth, 10 drops Bittermens Orange Cream Citrate, 5 drops of Scarborough Bitters, lemon twist. Stirred and served in a coupe. It’s also amazing in a glass of ice water or soda water for a non-alcoholic refresher, and it really wakes up a gin and tonic!